When I was learning to quilt, the only consistent about my stitching were the mistakes. A friend reassured me that the famous and fabulous Amish quilters always placed a deliberate mistake in their quilts in recognition that only God is perfect. After that, whenever I made a mistake (often), I would shrug and say, “Oh, that’s just my Amish mistake” (or my 23rd Amish mistake, whatever), and go on. 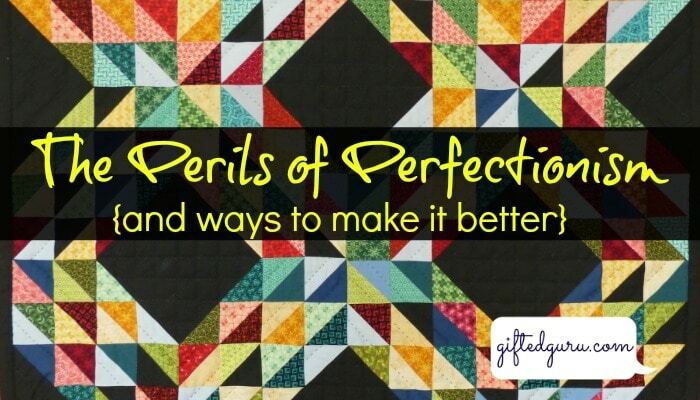 I have since discovered that the idea of an Amish mistake in a quilt isn’t really accurate, yet I still share it because it dovetails beautifully with an aspect of underachievement that has profound and far-reaching impact: perfectionism. All too often gifted youth find it impossible to forget their perfect offering, instead sacrificing themselves, their time, and their talent on the altar of perfection seeking. Aggravated Accuracy Assessors: I’ll do it over and over and over. White out was made for me! The fourth dynamic, Controlling Image Management, plays a key in underachievement because it manifests itself in apparent apathy and lack of concern for things parents and teachers want and need them to care about. It’s the obvious one. In reality, perfectionism and underachievement meld in virtually all of these scenarios. But this is not a lament, not an ode to the woes of perfectionism. What I want to focus on is what we can do – strategies to help gifted learners break out of these patterns, or at least learn to function within them in a way that works for them. Even though I know that my blog audience is adult, please allow me to share these thoughts as if it were the kids and teens themselves reading, because it is truly to my younger self I speak. Excellent is good enough. The whole idea of “anything worth doing is worth doing well,” is fine, but the idea “anything worth doing is worth doing perfectly” is hogwash. Rate each thing you’re doing on a scale of 1 – 5, 5 being something that needs to be done perfectly (think brain surgery), and a 1 being something that can take what my Grandma calls “a lick and a promise.” Most tasks will fall somewhere in between. Let them be there. It is a waste to spend Level 5 energy and time on a Level 2 task. You don’t need to hit a bulls eye every time. Don’t be your own worst enemy. The world will do a fine job trying to beat you down – don’t join in the chorus. When you feel discouraged, recognize it, name it, shrug your shoulders and try one more time. Perseverance. Grit. Determination. You’ve got it somewhere. Don’t hide it under all the critical self-talk that says you can’t do it, so you might as well give up. Vince Lombardi (a famous football coach) said, “The harder you work, the harder it is to surrender.” Work hard, and be nice to yourself. Just do it. Nike has it right with this one. In the book Alice in Wonderland, it is always tea-time at the Mad Hatter’s. His clock is stuck at 6pm for eternity (read the book to find out why! ), and so his table is full to overflowing with dirty dishes and he never gets breakfast because he’s always having tea. Don’t get so caught up on one thing that you stay there like the movie “Groundhog Day” doing the same thing over and over. My running shoes have laces that say “Shut up and run.” Shut up and run. Don’t worry about whether an assignment could be done better. Of course it could. Don’t worry that it might not be the best thing ever turned in. Of course it’s not. Just shut up and run. Step away from the White-out. Turn in your work and move on. Just do it. Be a Weeble and a Bozo. There used to be these toys called Weebles that had round bottoms. The jingle on the advertisement for them said, “Weebles wobble, but they don’t fall down.” Ask someone really old, like forty, to sing it for you. They can. There was also this toy that was a blow-up Bozo the Clown that was filled with sand on the bottom. Sorry, no song to go with it. Both toys were essentially the same – you could knock them over, but they wouldn’t stay there. You’re going to get knocked down. Get up. In fact, don’t even think of it as being knocked down; think of it as a wobble. Channel your inner Weeble and bounce back up. Fail Forward. Guess what? People mess stuff up all the time (think Large Hadron Collider – even you never messed up a particle physics multi-million dollar machine). It’s okay as long as you fail falling forward. Take your mistakes and make them worth it. Use them. Make them make you better. If you become paralyzed by your mistakes, you have surrendered to them. They have won. When I was in college, I had a professor who told the class, “I don’t give 100’s.” You know exactly what that did to me. I was determined that I would FORCE him to give me a 100 because I would earn it. I studied so hard (and I’m pretty good at that, actually). I consistently got the best grade in the class, and it was consistently a 99. And every time I would go to his office and demand an explanation. And every time he would show me where I could have done just a little better. By the end of the course, I was still getting 99’s, but boy were they better than the 99’s I’d received in September. The key is that to me, a 99 was a failure. Other people thought I was crazy (I know you know what I mean), but to me, anything less than 100 was not good enough. But something changed for me in that class. I learned to take that disappointment and harness it like oxen in a yoke. Harness your mistakes, don’t bow before them. full of adventure, full of discovery…. So guess what? It’s the journey after all. Don’t get hung up on the Sirens or taken in by the witches like Circe. Don’t get anxious and hung up on trying to get to your destination and worried that you’re supposed to be there but instead you’re frustrated with this one homework problem or essay. Here’s the key: it’s not finishing that’s important. It’s what you learn on the way. If you try too hard to be perfect (I know, I know. You’re not trying. It’s just how you are. I get it.) you can’t let the light in because it comes through the cracks. So close the book, put the pencil down, turn out the light, and make peace with the idea that you have done all you needed to do. Excellent is good enough. Don’t be your own worst enemy. Just do it. Be a Weeble and a Bozo. Fail forward and set out for Ithaka. Hope the voyage is a long one. They still make Weebles. They are one of Jordan’s favorite toys. I really enjoyed this one a lot!! I might have even needed it this week. Thanks!! They still make Weebles? I have to get some! You bring up an important point, Jennifer: Perfectionism can paralyze adults, too. Thanks! Giving these kids the gift of discerning between perfect and painful and good enough is one of my joys. I totally agree! Getting to the point where one can let go and accept “good enough” is tricky, but worth it. This article was awesome! I saw our son in many ways. This was shared with the kids at school so we were able to have a very good conversation that night with him. Thanks so much! Thank you so much. I’m so glad it was useful! Thank you so much for sharing these amazing resources!